Spring is nearly here and with it comes the time of cleaning out the cobwebs and freshening up the air and earth for a fresh season. Nothing says the time of change has come better than the endless array of decorating options. 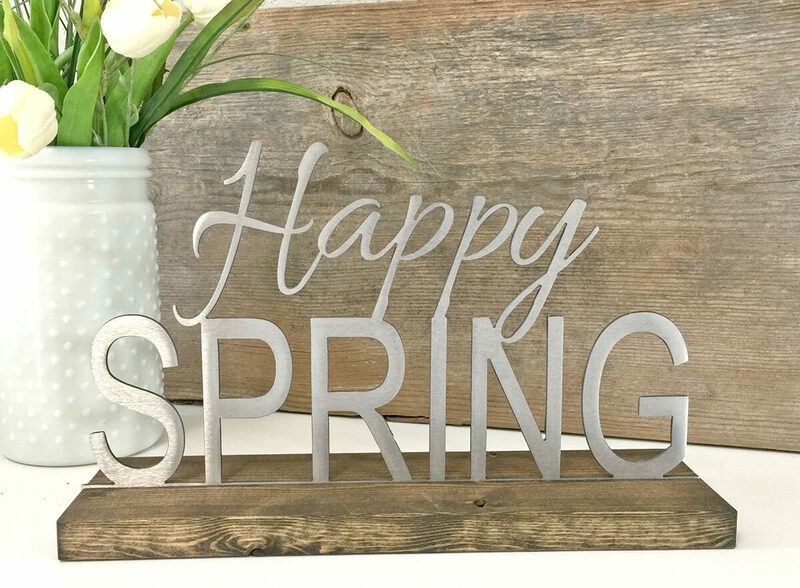 Once you see all the brilliant and lovable designs and ideas of all their spring decorations that come from the heart you’ll be hooked. It is such a great place to find inspiration and the perfect item to complete your holiday decorating scheme. No matter what the style might be there is always something that will work. Now that the snow is starting to melt in the north it will soon be time for the new buds to bloom and the next generation of wild animals to start their journey. We celebrate this period of hope and joy as all life emerges anew by finding places to add our own splash of color to what nature will bring. Indulge yourself with a bit of vintage mixed in with the brand new. Below is an eclectic look at some things that will show you and your home are ready for the warm weather. Hanging ornament is perfect for the decorator who wants a subtle rustic appeal with a little cuteness. It is so precious with its homespun striped green bow around the neck and bashful rosy cheeks. 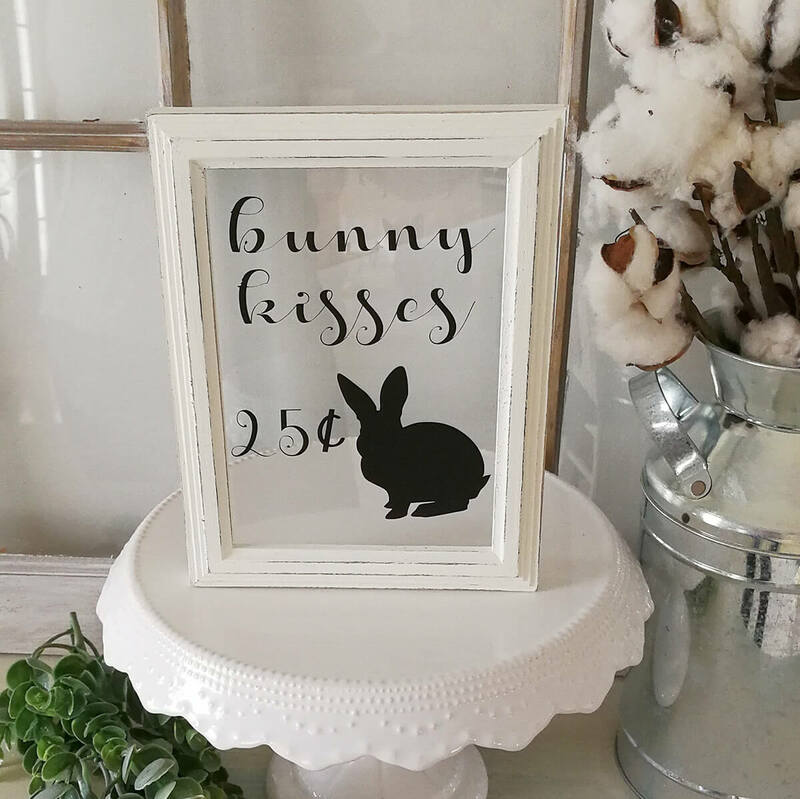 At 5 ½“ tall by 2 ¾” wide it’s a sweet addition announcing the handwritten Easter on its tummy below a little rust-red heart. This makes a lovely place to put a mix of petals to add scent to any room. This would also make a darling vase for short wildflowers to bring a wonderful splash of color to your décor. 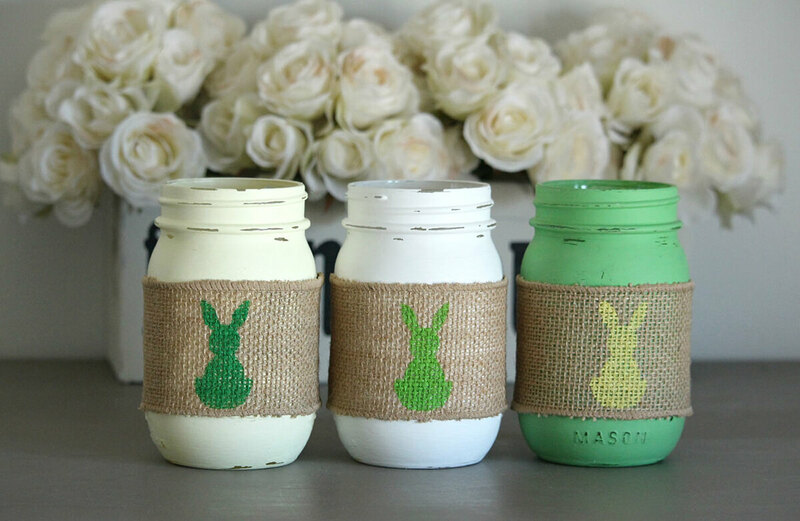 This standard size mouth comes on a jar 5” tall that is wrapped in burlap and has a painted bunny on each side. This boasts a lively mix of green moss woven amongst a dark wicker base to make a marvelous mix of natural color. 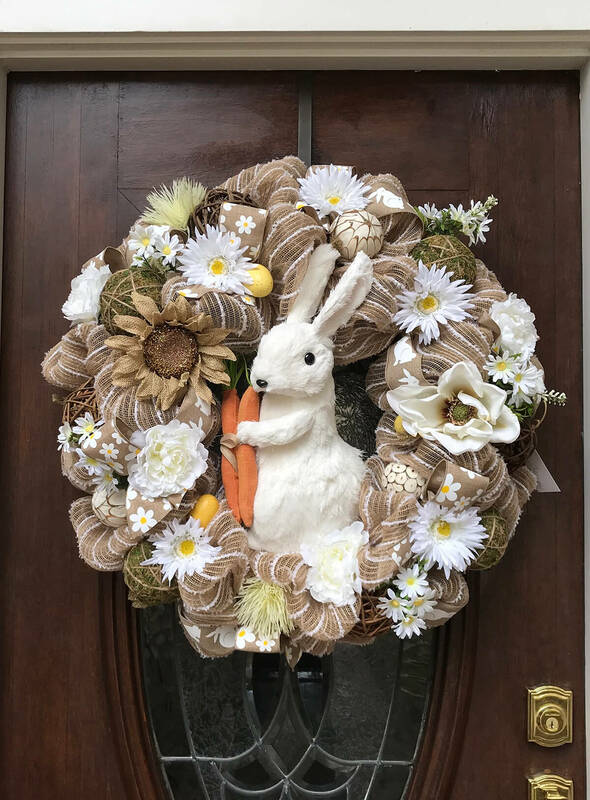 The addition of dried floral bulbs and wooden rabbit shout “spring is finally here” to enjoy the new life. It has an undeniable charm that will maintain its natural elegance for many seasons to come. 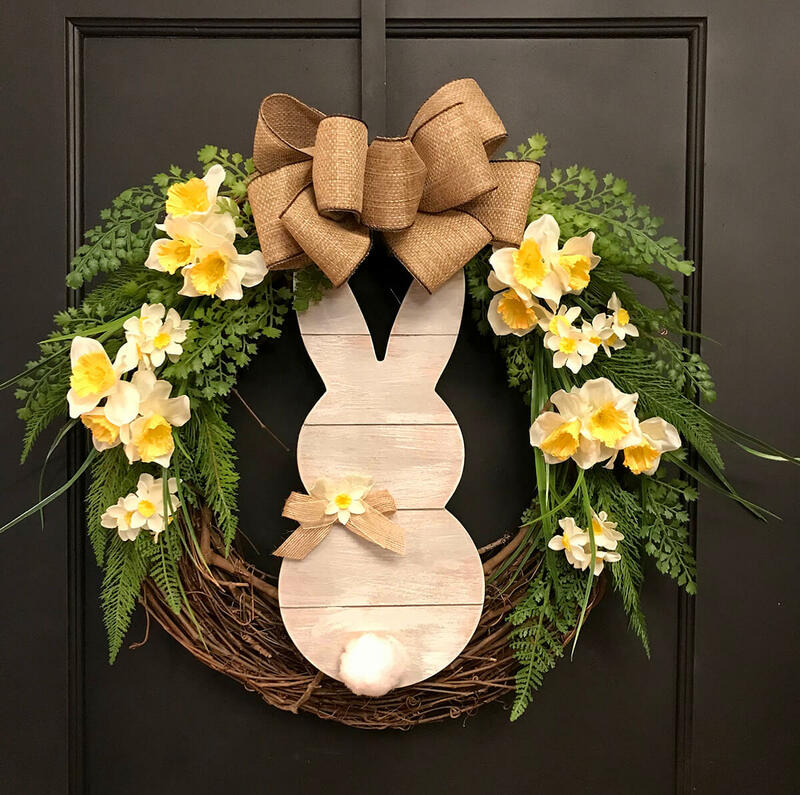 Handmade wicker wreath just makes the holiday come alive with its precious little bunny centerpiece. The assortment of white roses gives it such pure classic beauty overlaid on white wicker with fresh buds not yet bloomed. The accompanying look of fresh greens gives it a delightful accent for any front door. 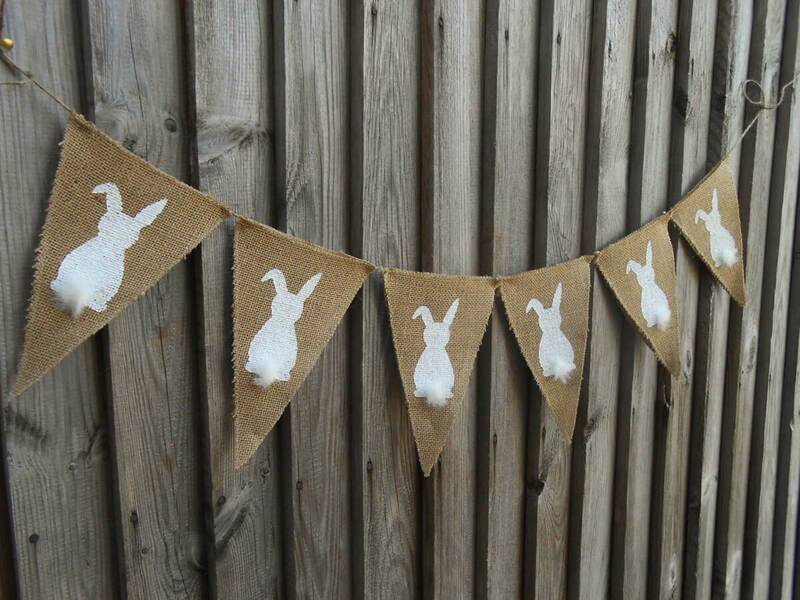 This jute strung banner is a cute addition to the decorative landscape for Easter with its hand-painted bunnies. The added flare of fluffy furry tails brings the floppy-eared critters to life for the little ones, too. The 9” pennants can number between 3 and 12 with 40” of extra string at each end to make it versatile enough to hang almost anywhere. 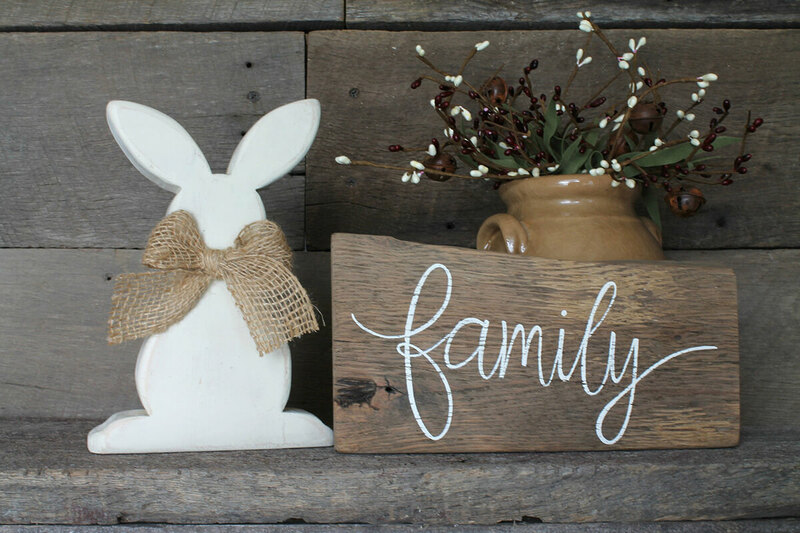 The white bunny painted on a fence-board sign has such a rustic appeal with reclaimed wood. Measuring 14” tall by 11” wide makes it the ideal size to highlight any area without needing too much space. 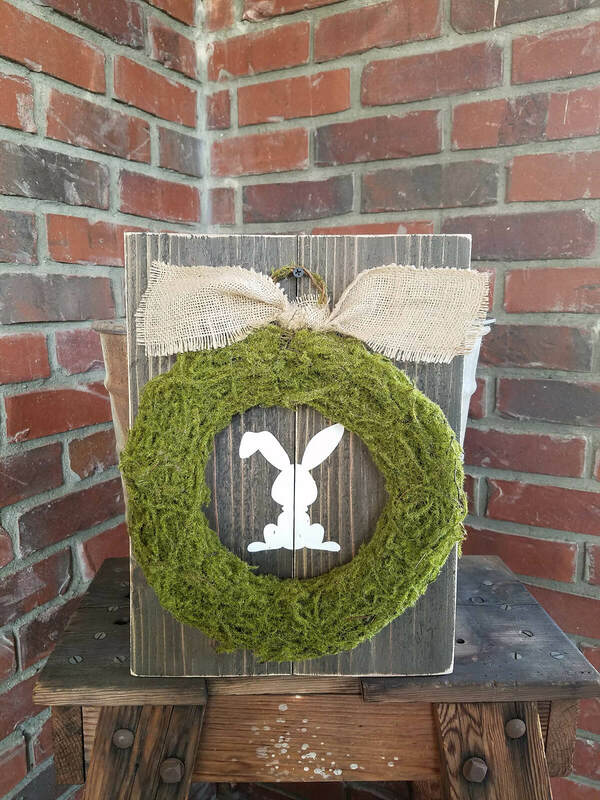 The wood backing gives each of these its own unique design while natural moss and burlap make it a crafty delight in rustic Easter decorations. 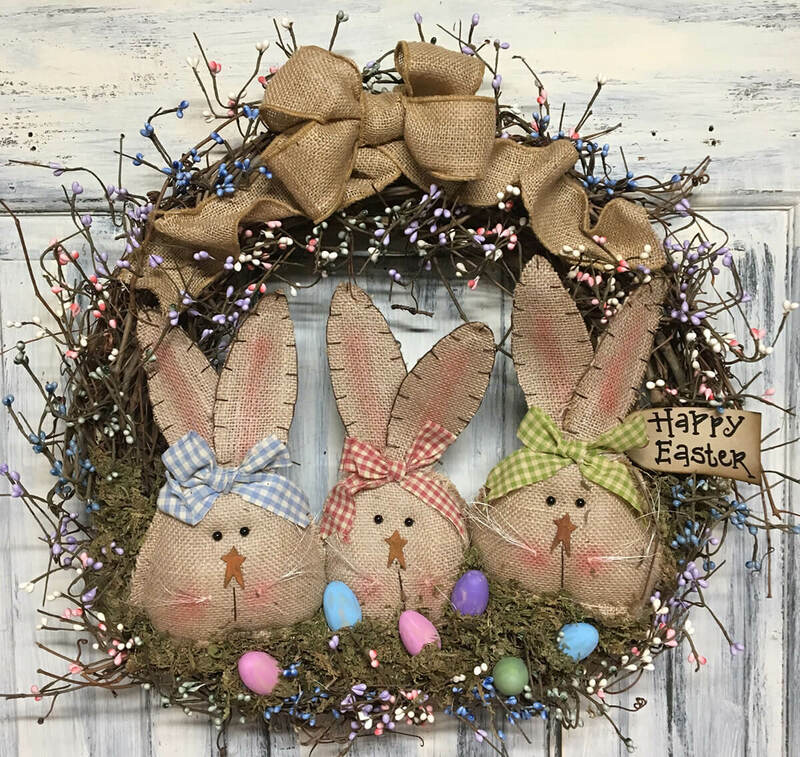 The adorable while shabby yet chic design of this wreath with burlap bunnies and bows shows wonderful creative style. The vibrant colors and simple burlap combine for a wonderfully rustic yet childlike appearance. Brightly-colored eggs and a mossy bed nestles the bunnies so naturally, for a look that is just pure fun to hang anywhere, it can be seen. 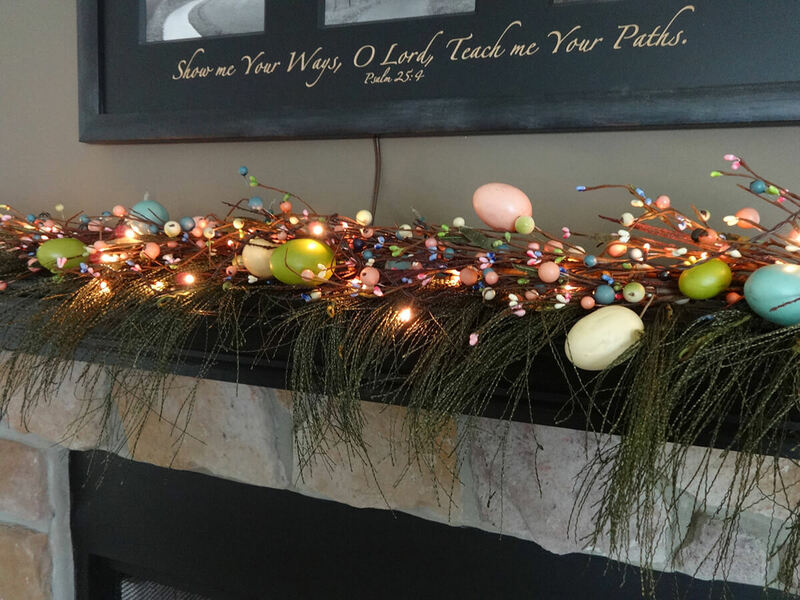 This simple design is a lovely addition to any mantle or doorway for Easter. 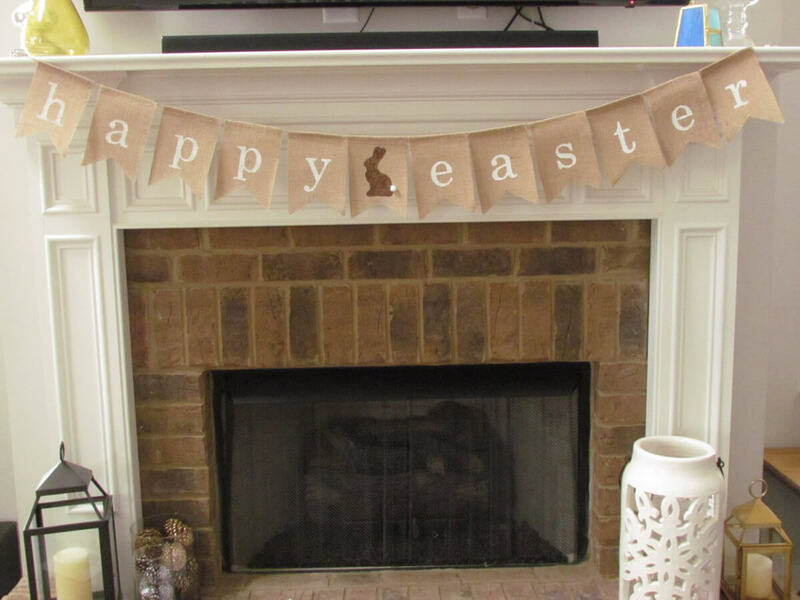 The little bunny in the center has a cute little pom-pom tail that accents the banner to give it a 3-dimensional appearance. The burlap pennants give it a country kind of feel while the whole thing can be made in different colors to fit any given style or tone. This wreath with its daffodils accenting the green ferns and grasses is so darling it belongs in a picture frame. 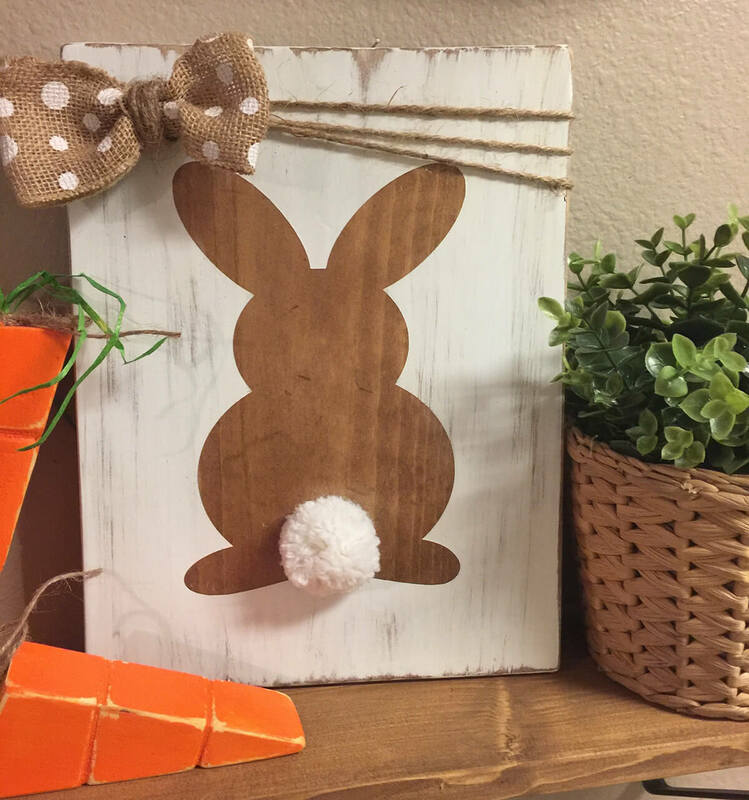 The little bow on the wooden bunny just sets it off perfectly as it sits below the large burlap ribbon bow. The clean contrast flowing smoothly between the dark grapevine and bright flowers makes this just divinely exquisite. 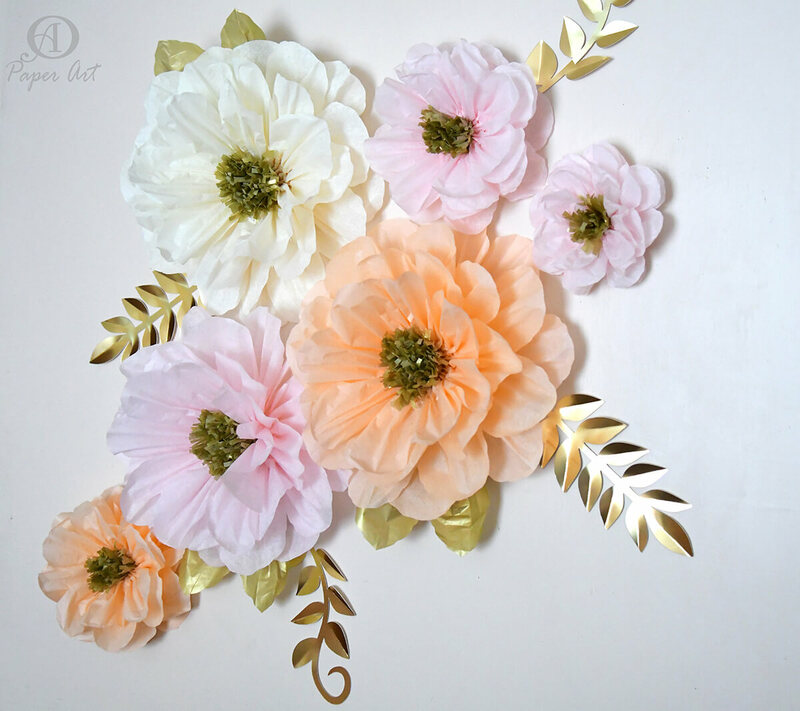 The colors of these tissue paper flowers is truly eye-catching with their gold leaf adornment. They come in cream, peach, and light pink and are absolutely stunning for a decorative wall hanging or even as a table centerpiece. They would work really well on an arch or trellis, as a backdrop for a wedding, or springtime garden party as well. The collection of flowers and ribbons surrounding the large white rabbit are quite similar to what one would expect of Victorian décor. 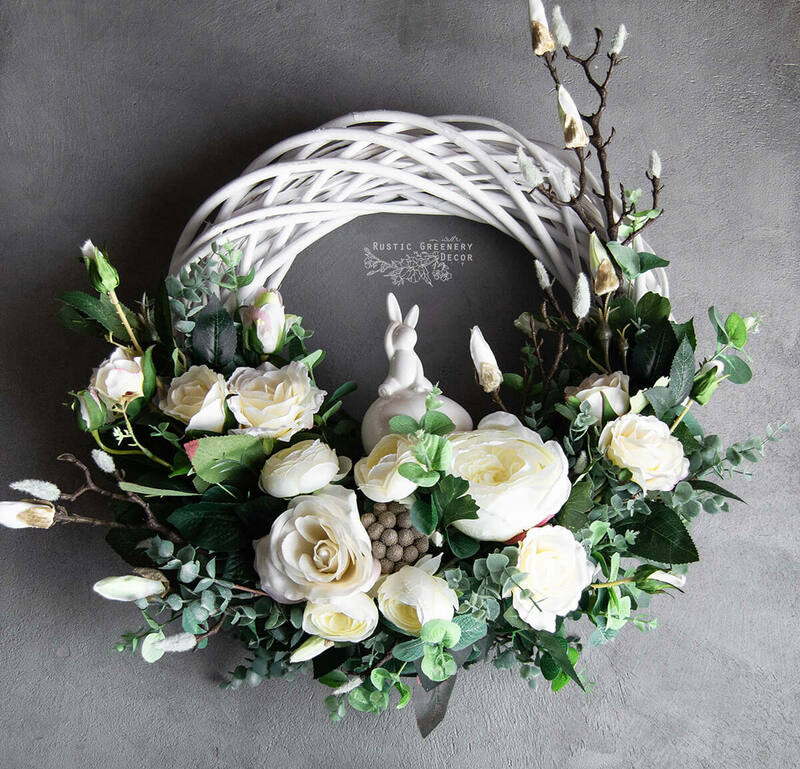 There is so much going on with this wreath that makes it so luxurious and pristine. The striped cloth and decorative balls just give it a marvelously classy and lifelike drama that draws attention to its detail. The simple design of the onyx text on ivory background gives this sign an old world aesthetic that hearkens back to a simpler time. It reminds one of a shipping crate from a bygone era reminiscent of childhood. It is 15” tall by 8” wide and can be customized with different background and text color as well as stain options for every taste! 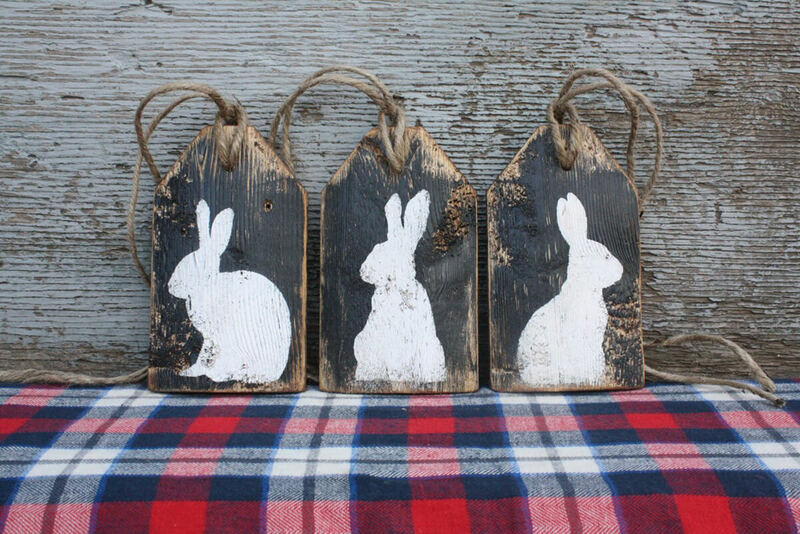 The antiqued paint and distressed wood make these tags look like grandpa saved them from his childhood Easter. The mutually unique appearance of individual natural wood pieces just adds to their rustic appeal. This nicely finished 3-tag set strung with jute will bring the look of an old farm to any home for the holiday season. Each of these pieces is cut by hand from different pieces of reclaimed wood before being sanded and painted multiple times. The result is such a classic image of Spring with a basket of carrots fresh from the garden. They even come in different sizes ranging from six to eight inches to make them even more like the real thing. The dark stain and vibrant pastel colors of the lettering bring brightness to this sign. 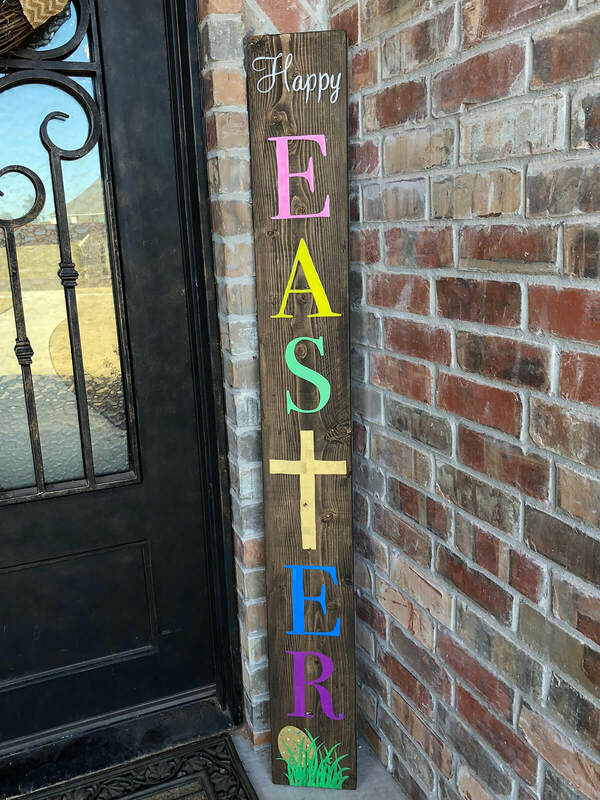 It has an adorable little patch of grass hiding an egg at the bottom and still shows the reason we celebrate with a cross for the “T” in Easter. Festive yet fitting this “Happy” greeting is right at home by the front door. This runner says spring has arrived with its bright assortment of lovely flowers and greens woven together. 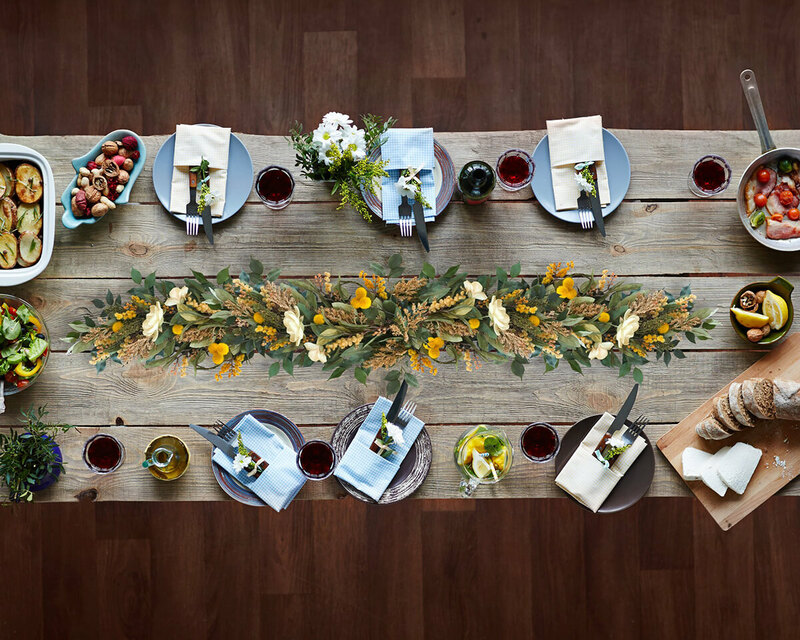 This sets the scene at any table for a family feast or decorating the doorposts as a welcome home from nature. The faux fig and eucalyptus leaves make it a bit exotic and it comes in lengths from 3 feet to 15. 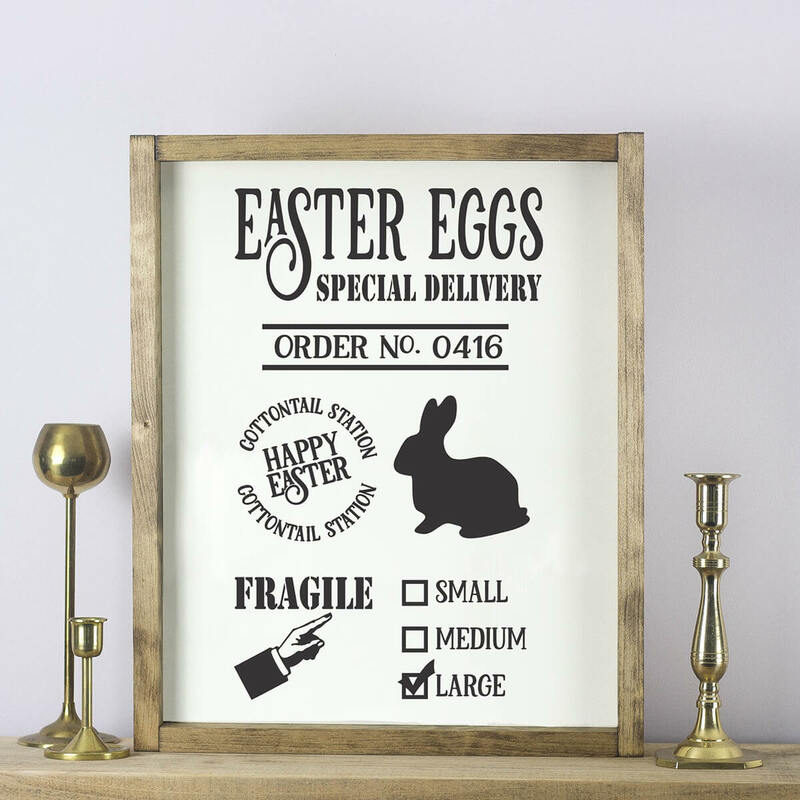 Nothing announces spring and Easter the way the image of a bunny does on this wooden sign. The bunny silhouette is so cute with the polka-dot bow and fluffy pom-pom tail it almost brings the character to life. 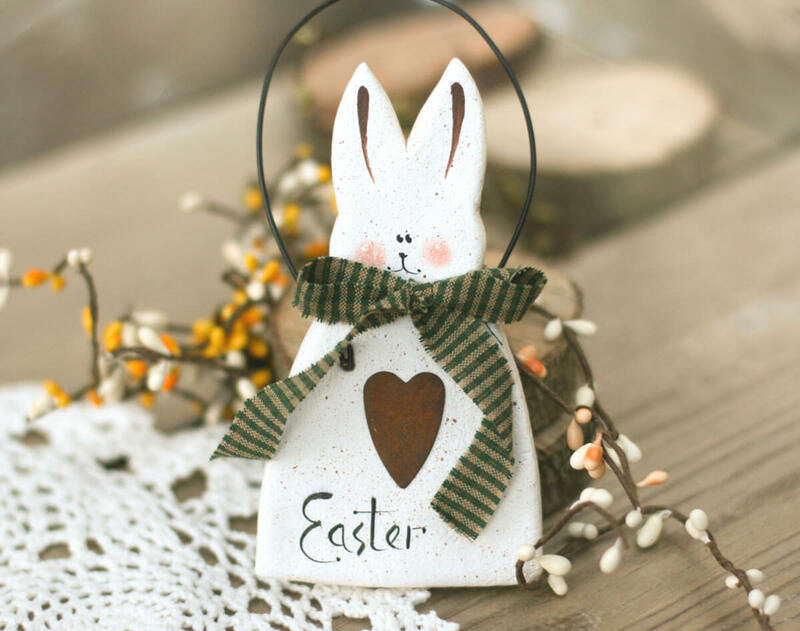 Simple, sweet, and pretty is the style this will bring to any display of rustic Easter decorations in your home. 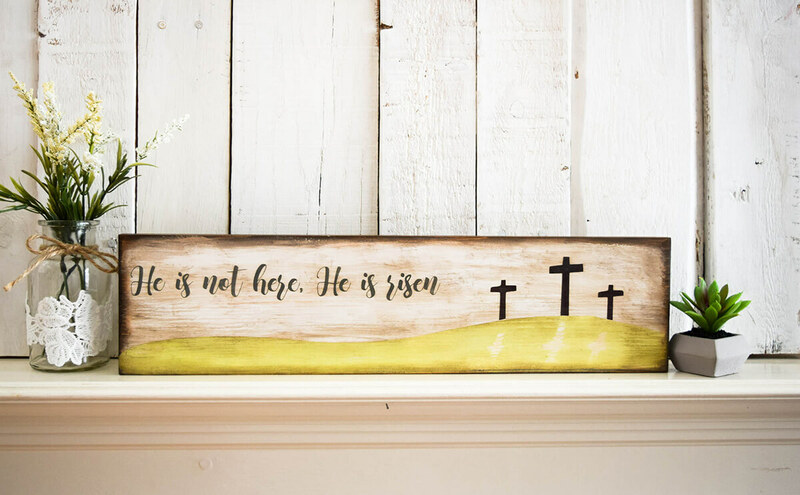 What a beautiful reminder of the cause for celebration with this distressed wood sign that tells us “He is risen“ to bring hope to all. The weather-worn look gives this antiqued sign an aged appearance that seems as though it has been handed down for generations. It is inspired by Matthew 28:6 and is 15 inches long to fit almost anywhere. 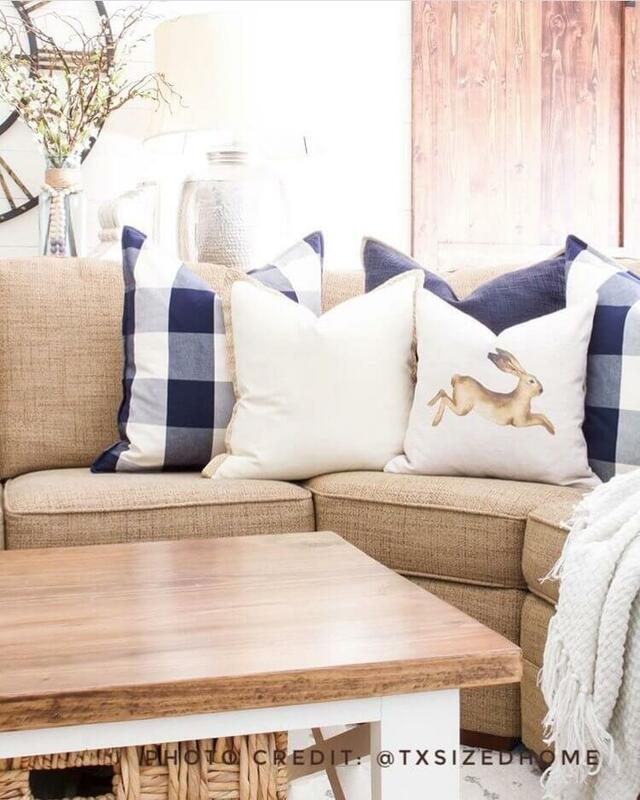 Spring-time comes indoors with the charming pillow cover with a country bunny. These decorative cases are made of 100% linen and have a printed image that won’t fade from washing, too. Add some life to the living room décor with these lovely covers that are so cute and simple but sure to please hearts of any age. 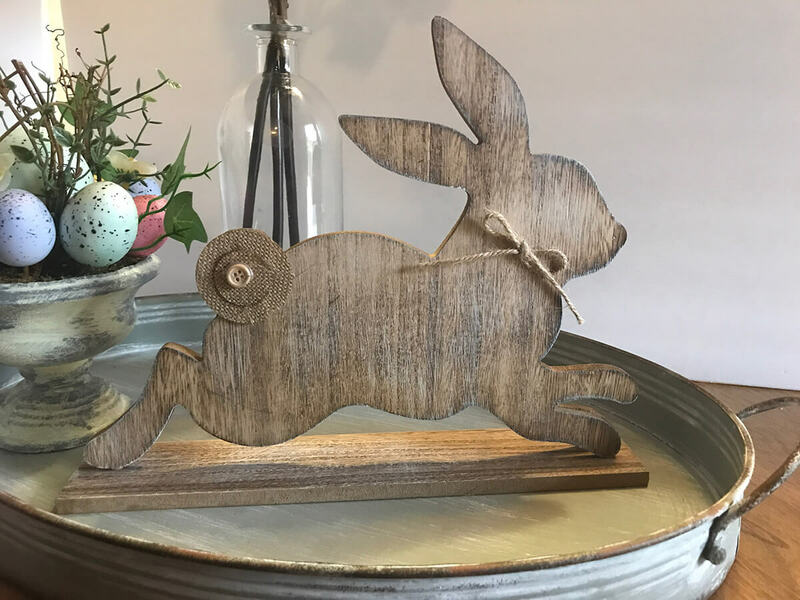 The simple bunny silhouette cut from 1 ½“ thick wood is the perfect addition to all your spring decorations. 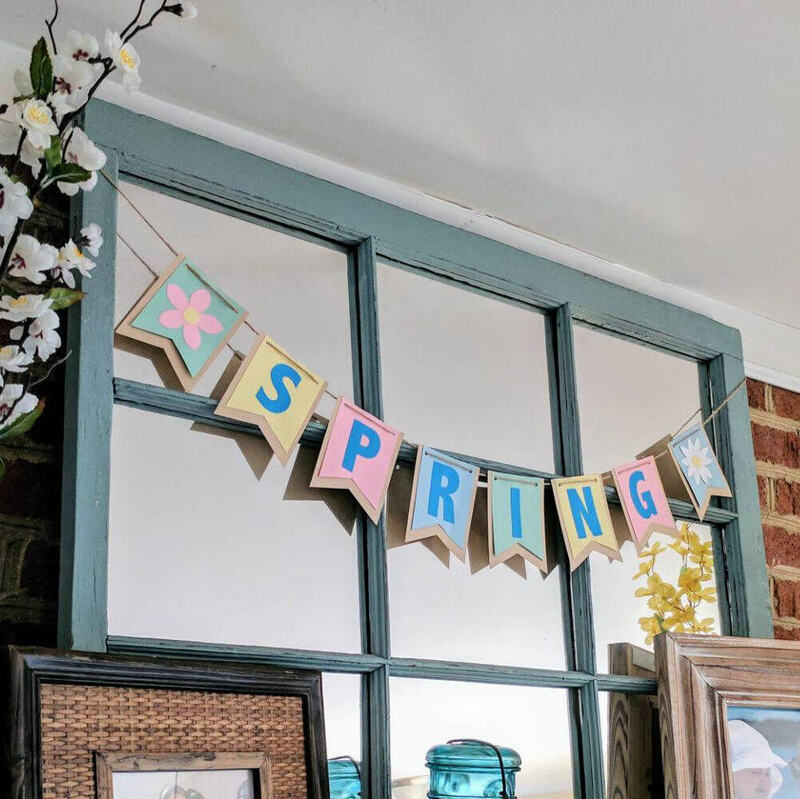 At home on the front porch, in the sunroom, or by the baby’s bedside, it brings the feeling of spring. This 8” tall bunny is such a wonderful piece that makes itself at home anywhere you place it. This wreath is just bursting with bright colors and fun to give any front door a happy greeting. 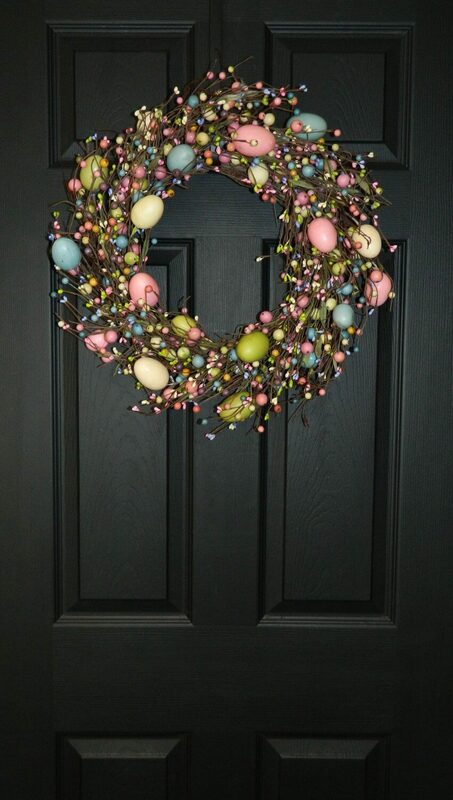 The contrast of dark grapevine with pastel berries and eggs is electric and so welcoming to have displayed for spring. The larger eggs and tiny berries make it sparkle and in overall sizes from 10” to 24” it fits everywhere you might think to put it. 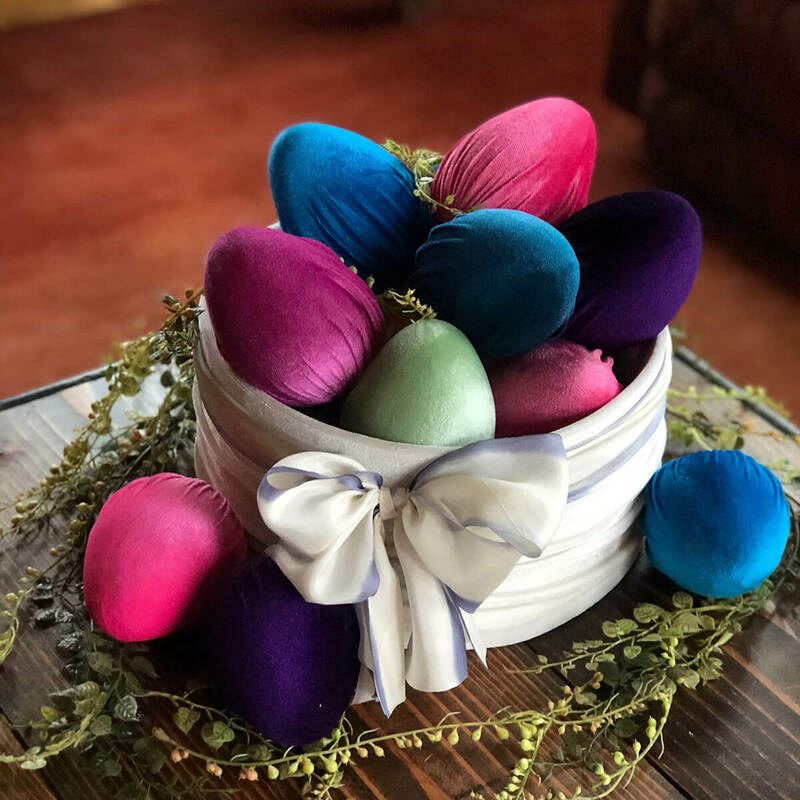 These wonderful velvet eggs are stitched and dyed by hand to bring a colorful accent to any Easter regalia. They come in seven different colors that look as soft as they feel. They would be great in a centerpiece basket, Easter wreath, or placed about to make each day at home an exciting egg hunt. 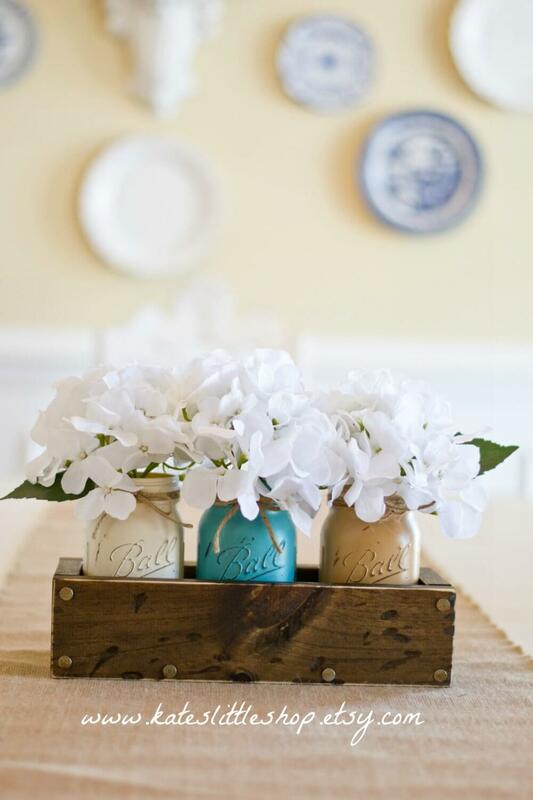 There is just something so familiar about a slightly worn stained wood planter and painted jars that sets you at ease. Its understated elegance only lends it more charm and soothing comfort. Filling the jars with a scented mix of potpourri before adding blooms is a great way to enjoy this setting in two ways anywhere it goes. The modern look of steel is blended with the rustic appeal of stained wood, and it really brings this decorative sign together. 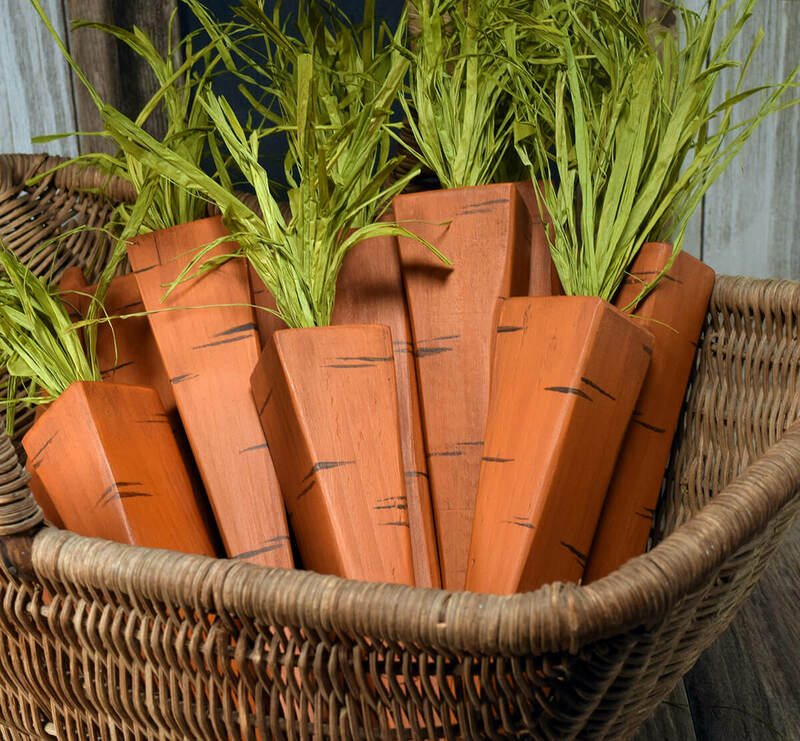 It is sleek and clean, but with an earthy charm in its 12” long pine wood base. It can even be easily taken apart with very little effort for easier storage when the décor is transitioned for other seasons. 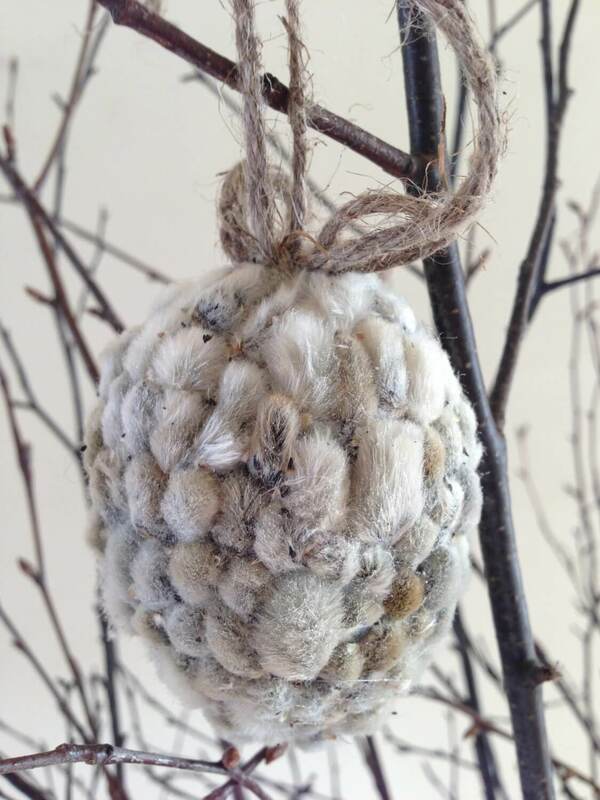 These neat hanging egg collections are made of Styrofoam and then covered with catkins to look like a bunch of fuzzy eggs in a sack. This is an old-world tradition that is recently becoming a popular trend among the decorating enthusiasts of today. The natural look of jute and catkins adds a vintage farmhouse style that fits any age of fashion and design. 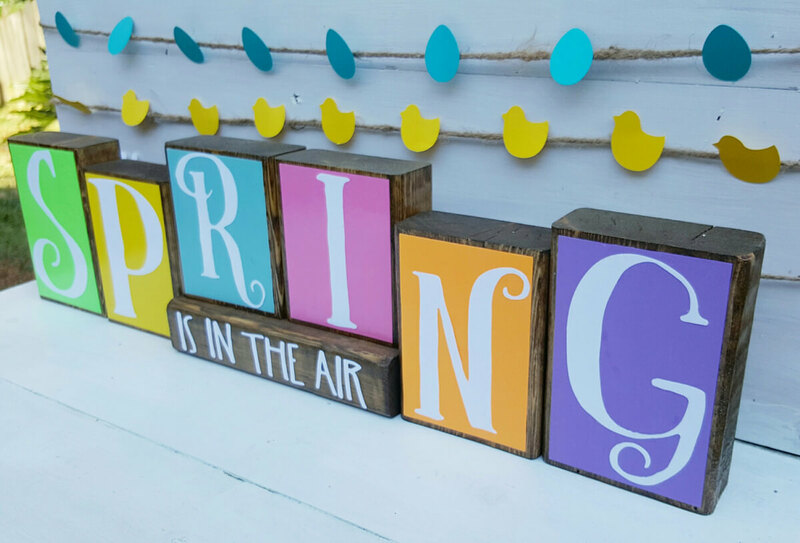 This simple banner is about 30” long with 4”x3” pennants in bright colors announcing spring. This is sure to bring cheer to any room as it reminds of the promise of new life that is fulfilled every year after the thaw. The bold pastels inspire thoughts of blooming fields of wildflowers with their stunning hues lit up on a clear and bright sunny day. 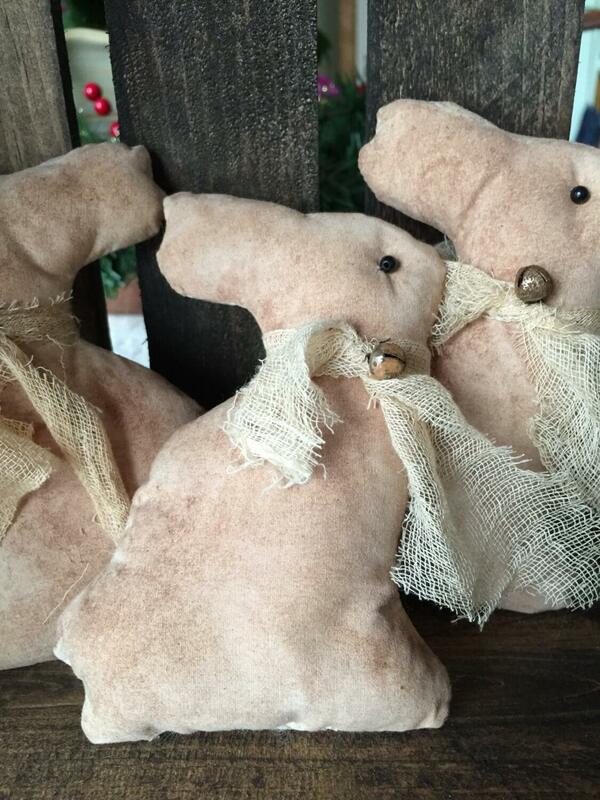 The stained and distressed look of these cutout bunnies are very rustic with their twine bows and button tails. They have different poses of running, sitting, and standing, which is great if you want one for a table or shelf and a wreath. The use of natural wood makes it easy to find it a fitting place in any room of the house. 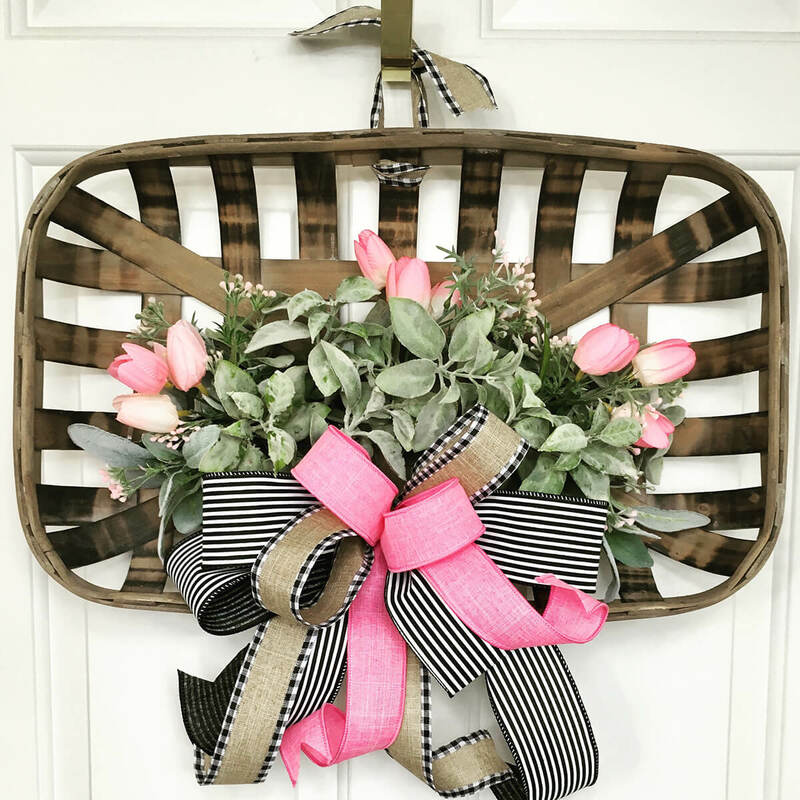 Pink tulips and lambs ear give this basket hanger such an endearing beauty of tender things that it looks good with any door. The soft look of the lamb’s ear offers a gentle greeting to all who come to your door. The colors matched in the striped ribbon and bright pink bow with the rest of the arrangement makes it all flawlessly sweet. This is such a fun garland with its lights reminiscent of other seasons of celebration that seem to go by too quickly. The different colors on the eggs to bounce light off of makes a warm glow that really adds some peace to the setting, also. The natural look of green grass mixed among the brighter shades says Easter time is here. 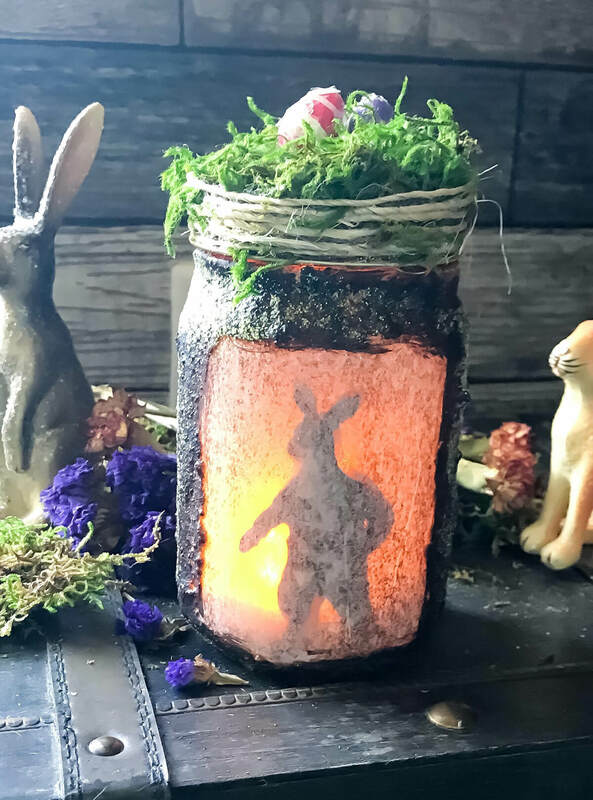 These jars are so heartwarming with their underground bunny all lit up inside below the moss and sisal covered with Easter eggs. The eggs are spun cotton that was painted and coated with mica flakes by hand to make each one special. The illumination is just a simple led light ball that can be readjusted or removed entirely at will, too. The distressed paint on the wood frame of this sign is a great antique look for this cute accent piece. The basic contrast between the clear glass and black stenciling is pure antique farmhouse elegance. Distressed white or black are the color options for these frames that come in two sizes of 5”x7” and 8”x10” to make the right impression in any placement. 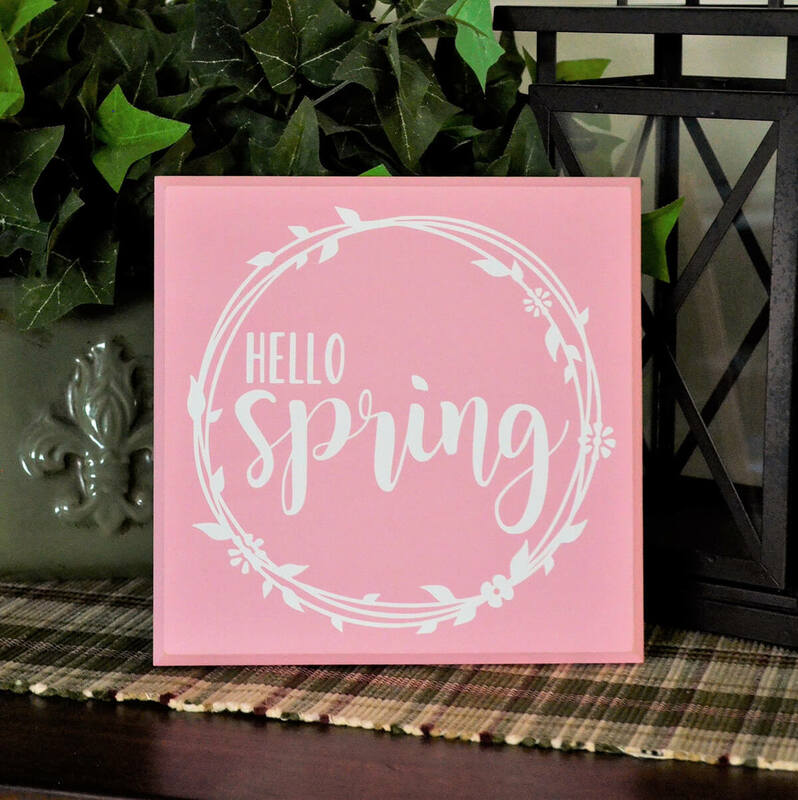 This pretty sign measures 8”x8” and is a cute little addition to your holiday décor to help welcome spring. It is painted in a bright pastel and overlaid with durable vinyl print in any color to fit your style and taste. They could be set almost anywhere, hung on a wall, or even propped up in a stand as you like. These strings range from 2m to 10m in length to accommodate location and interior design style. 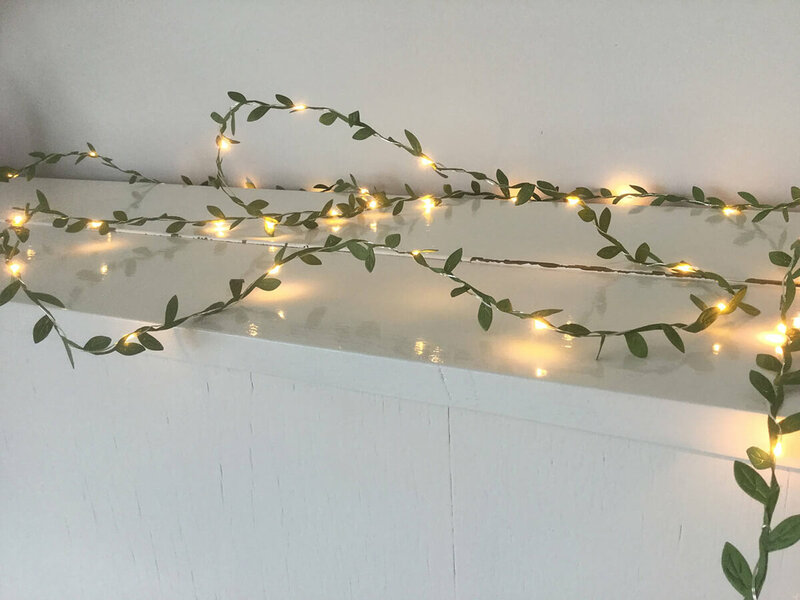 They brighten up any space and add a little extra creative flare with the leafy garland entwined alongside the bulbs that looks great in many uses. These would work so well across a mantle or crowning a doorway and also make a great centerpiece accent. 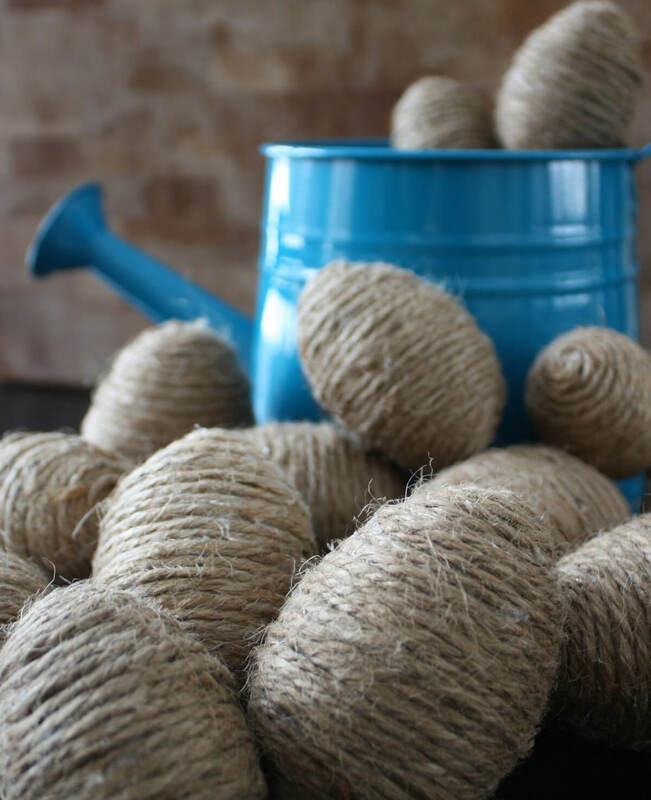 These foam eggs are wrapped in jute twine of various colors to make a lovely addition to an Easter wreath or centerpiece. With 12 in each set, they could be used in lots of different places before you run out. Simplicity in appeal combined with the right amount of color is what this one is all about. These darling little critters are just so adorable whether you put them out in a bowl or scatter them about like real wild bunnies. There is certainly nothing that says spring is here like when there are baby rabbits everywhere. The rusty bell and cheesecloth bow make these pink pieces a classic choice as rustic Easter decorations. The colors in this garland just pop and put in mind a string of sugary candies you can’t wait to try. 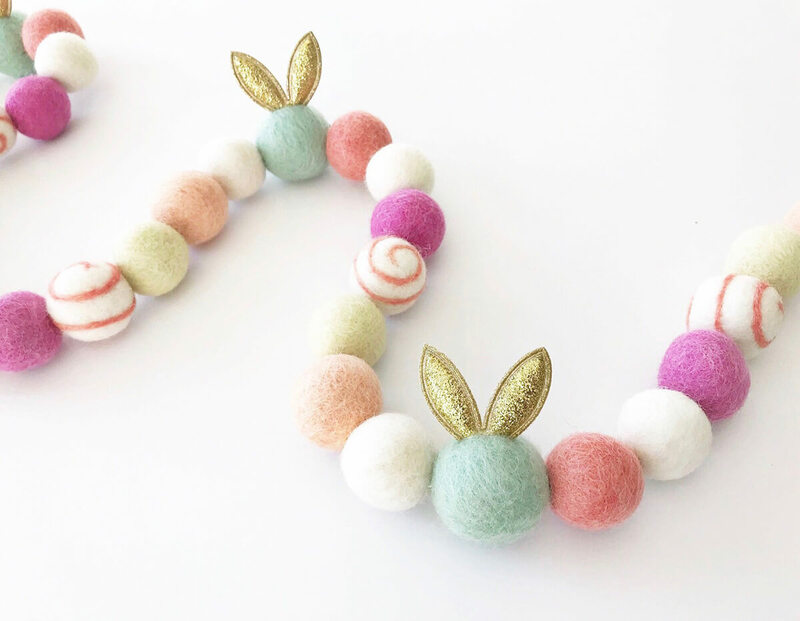 The cute little-felt balls with their bright happy pastels look simply delicious to the eyes as well. 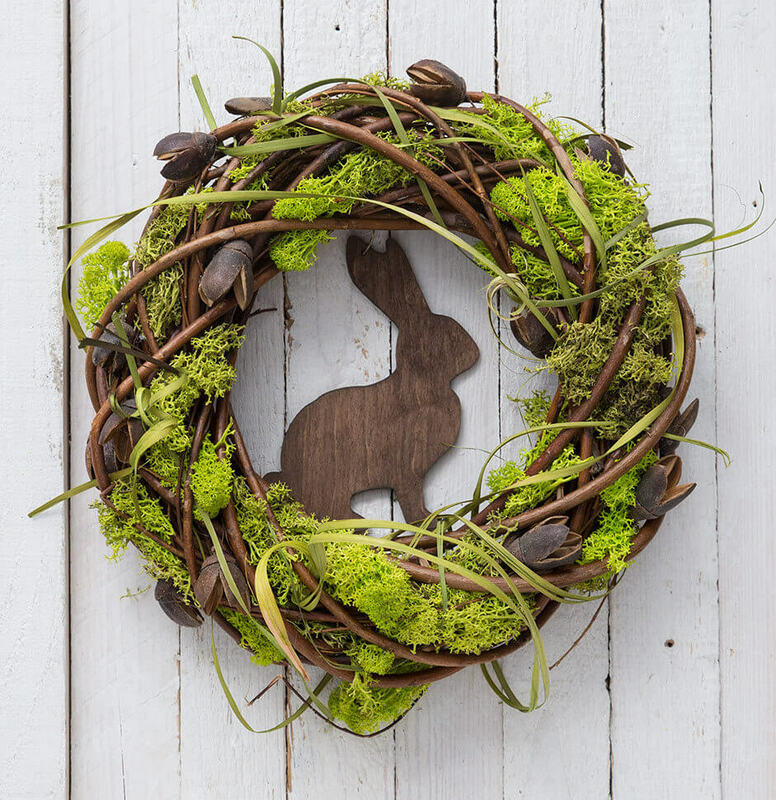 Spring decorations are supposed to celebrate youth and rebirth, which this does in lively tones and little hares. Brilliant colors let you know what this sturdy set of wood blocks means when it says “spring is in the air.” It is all about new beauty of every imaginable hue emerging from the once frozen ground. This is a great public front porch greeting for all or a charming personal decoration for the garden shed. There are so many options that all seem to have the appearance you want when decorating it can be hard to choose. Deciding which ones to use and which to save for next time could be the hardest part. Take a hint from what you see here or create your own look by making new matches. There is no way to go wrong if it’s all right. Whatever decision is made on the direction and palette to go with something can always bring it all together.